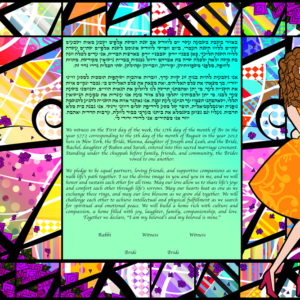 You & I Ketubah is a modern take on the ancient Jewish concept of “romance.” Romance, in all ancient traditions, mixed and matched boundaries in the most unexpected ways. 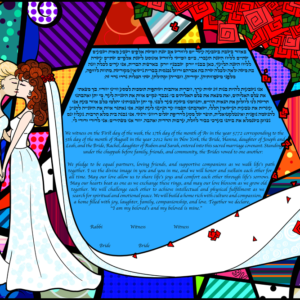 You and I Ketubah takes these ancient boundaries and reshapes them in a way to combine the subtle and obvious sides of the boundaries: the outlines of two women, the strong contrast between the silhouette and the pure, naïve white background. This work takes the cliché of “love knowing no boundaries” and flips it on its head by simultaneously breaking boundaries while using a silhouette and contrast precisely to emphasize the boundaries. You & I is perfect for the lesbian couple that has a cheesy side to them, as our team of artists do (we are proud of our cheesiness! 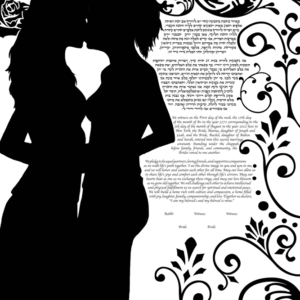 ), that wants to use the simple and even naive style to capture the depth and subtlety of their love and passion together.